﻿ When I first saw this truck it was like one of those breed of dogs that is so ugly that they start looking kinda cute. 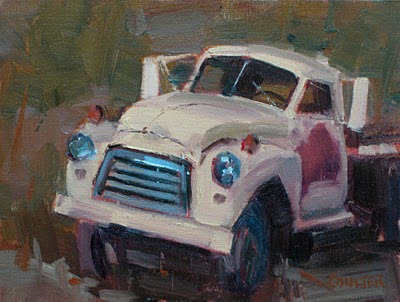 It grew on me after a while until I had to paint it because of the extreme character and a sort of social standing among the other old trucks in the lot. It was like, Man! this truck has seen it all! I usually prefer to paint standing up because it seems my paintings are livelier and I can step back from my painting easier. Only problem is that my back gets tired standing. I'm glad that with my easel I can raise the tripod head and invert the panel holder to paint sitting down sometimes. 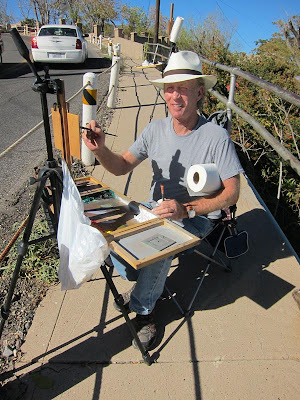 Carol took this picture on a curve in Jerome. 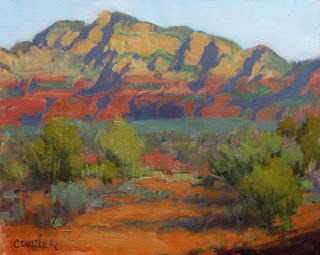 One day Carol and I decided to take a break from truck land and go off down into the Red Rocks of Sedona. It was just a few miles down the hill from Jerome. We got out there pretty early in order to capture those purple shadows. It took a bit of a hike to get down to a good spot where you could see through the Juniper trees. This spot is looking toward the Palaki Ruins in the distance. 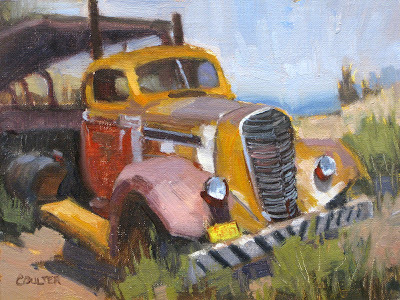 ﻿ I had been eyeing this truck from the time I first came up to the Ghost Town. I took photos of it, but Carol ending up painting it first; I think it was Carol's best painting of the trip. I set up next to her the second time she painted it and we painted it together. I have a couple posts today to catch up with Carol's. 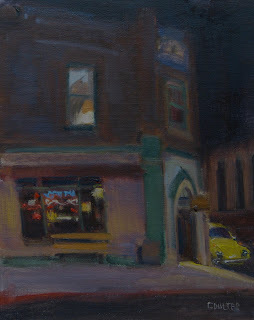 I have my nocturne done on the streets of Jerome. I have loved the little town of Jerome ever since moving to Arizona in 1975. It had been an old mining town (Copper, silver, and gold I think). It is built on the side of a mountain so many of the houses (many are Victorian style) are on stilts and the streets are curved and going up or down hills. There were a lot of hippies living there back in the 60s and 70s and I think there still are some there. The town has that cozy welcoming feel to it. The night we did our paintings outside the tavern they call the spirit room (stories have it that there are spirits from the past walking around and sitting at the bar on occasion), there was an open mic, so we got to hear some very fine singers. Carol sold her painting when the girl that worked there walked out and said "that is my car". It was a cute little Volkswagen under a yellow light. We had run into a painting friend of mine Mark Hemleben the day before and he was painting with us that night. Mark wondered into Jerome with a few bucks in his pocket 15 years ago and has been there ever since. I had walked by this old firetruck numerous times during the week and it didn't really spark anything. 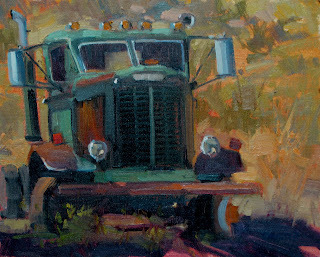 The night before I painted this one I had a vision of painting this scene looking at some other trucks in the opposite direction. 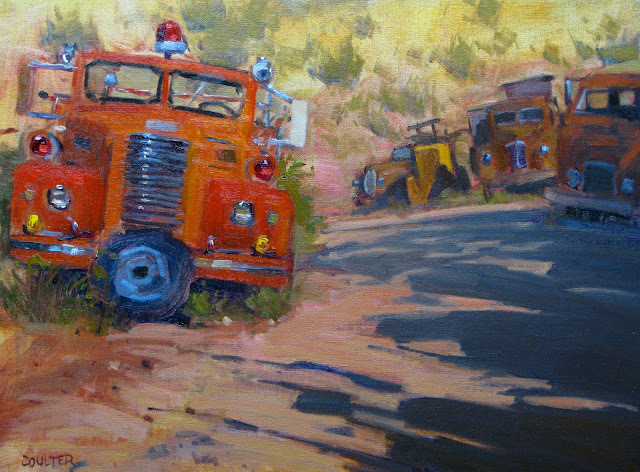 When I got there, all of a sudden I saw these shadows patterns and the Fire Truck together and that was it. I got out a 12x16 and went to work. 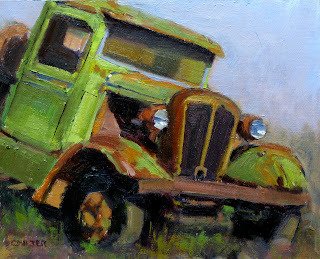 Carol and I both painted this truck together. Well she painted it first, but I saw it first...HA! Anyway it had so much personality, it was like a Disney movie come to life. I think it had a water tank in the back, so probably was used to haul water for the mine maybe. The Ghost/Mining site is on the side of a mountain so the sun goes down earlier than it does on the flat land. I knew I had less that an hour to whip this last one out. There was no time for thumbnails, etc., just get the paint up there. Actually I think it was one of my favorites..real simple and an unusual design. This truck reminded me of something they would hall Nitro in for the mines, very slowly that is. I walked around the thing for quite some time before nestling back in between a huge old crane and another old truck; In a spot that the ground was soaked with oil. I liked the close up on it, but when I go back I think I'll try one a little farther back. ﻿﻿ The Ghost Town has two levels, the upper one has an old one piston Lumber Saw that still works. They also have a loud steam whistle they like to blow ever once in awhile. The guys working up there probably have way too much fun. I told Carol that if I applied for a job there, it wouldn't matter how much they paid. Ha! Well Carol and I made our way up through old Jerome and to the Ghost town on the mountain. 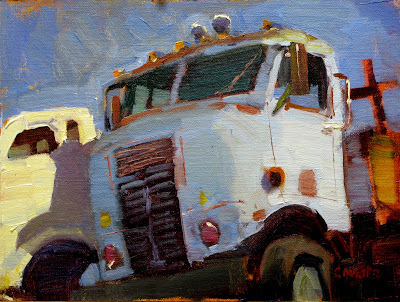 It's like a grave yard for old trucks, but some of them are in mint condition and worth a lot of money. Carol said she felt like a little kid in a candy store when we first started walking in amongst these wonderful relics from the past. She found a handsome old red ford with 2 exhaust stacks coming up into the sky. I chose a sort of menacing looking Semi truck which I found out later was a '49 OSHKOSH. 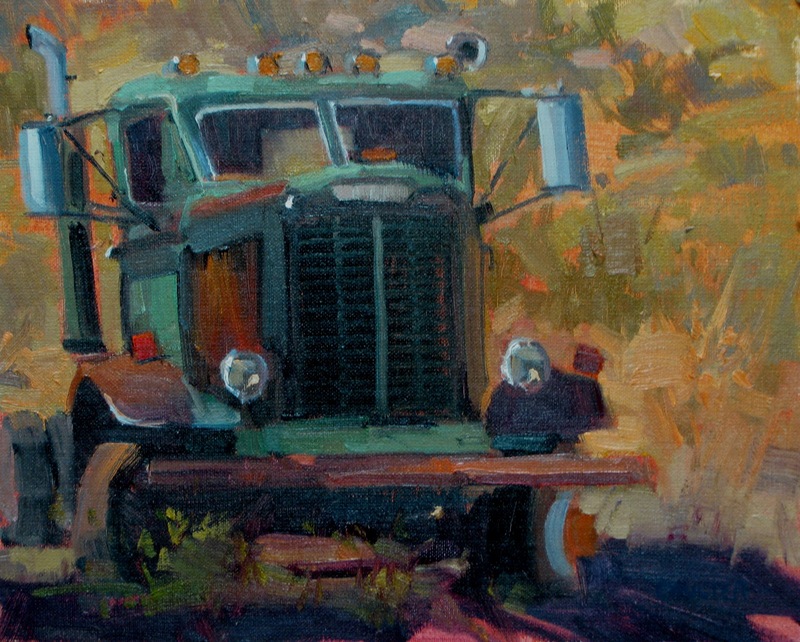 ﻿ There's something about roaming around, peeking inside, and then painting these trucks....to smell the oil and dust, with the coil spring seats, and to bang on the door and hear that solid heavy metal sound...nothing like it! Carol Marine and I decided to embark on a short plein air painting adventure with trucks and planes as our main subject matter. 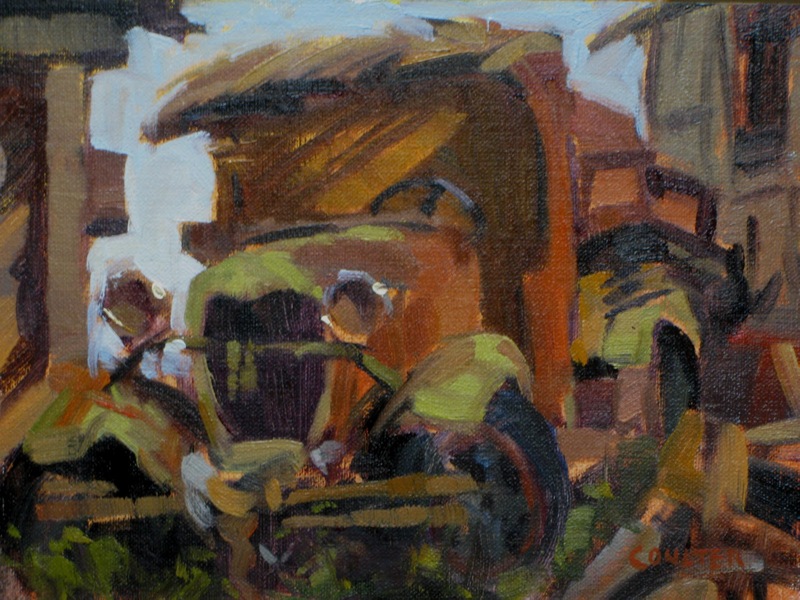 She usually paints still life and I usually paint landscapes, so it was something different for both of us. 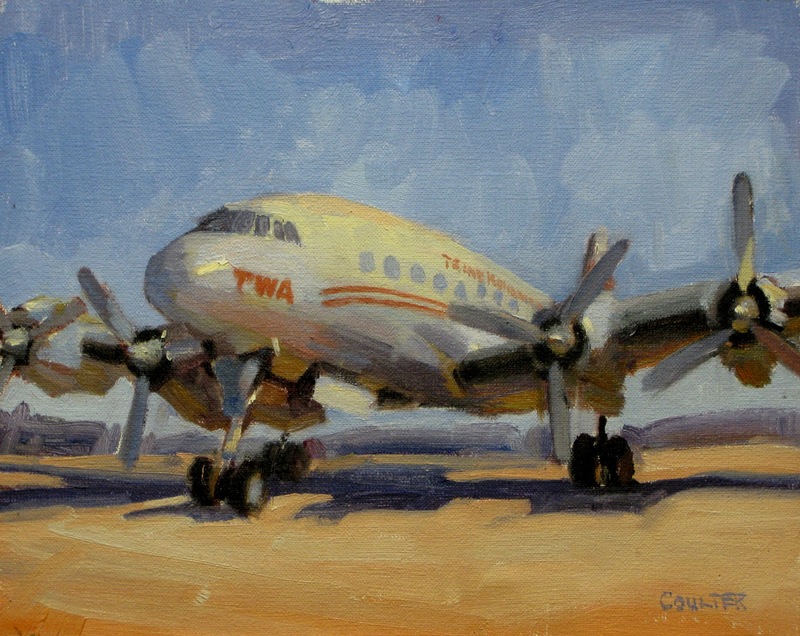 We started down in Tucson, AZ at the Pima Air and Space Museum. We arrived late in the afternoon, but had time to make a quick tour. We ran around and found our favorite planes and ended up in a huge hanger where there were some old restored WWII bombers. There was a retired Air Force gentleman there who had flown these planes and he gave us the history behind them. He was very proud of the way Americans became a team during that war to do whatever they possibly could to win and save the freedom of this wonderful country. Women worked in factories and young teenagers were flying in these magnificent bombers to do their part in the war. We listened to him so long that the museum had closed and we had to get someone to unlock the door to let us out. 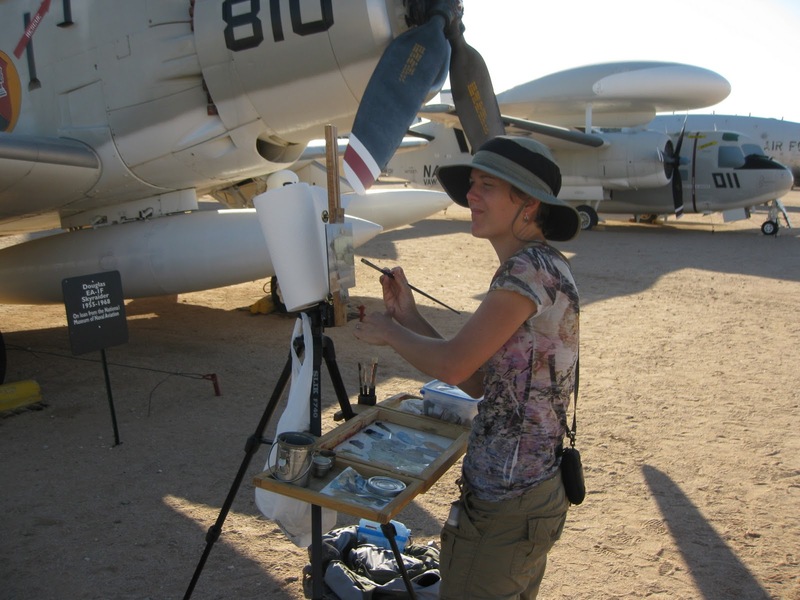 We arrived back at the museum early the next morning and pick out our planes and started painting. 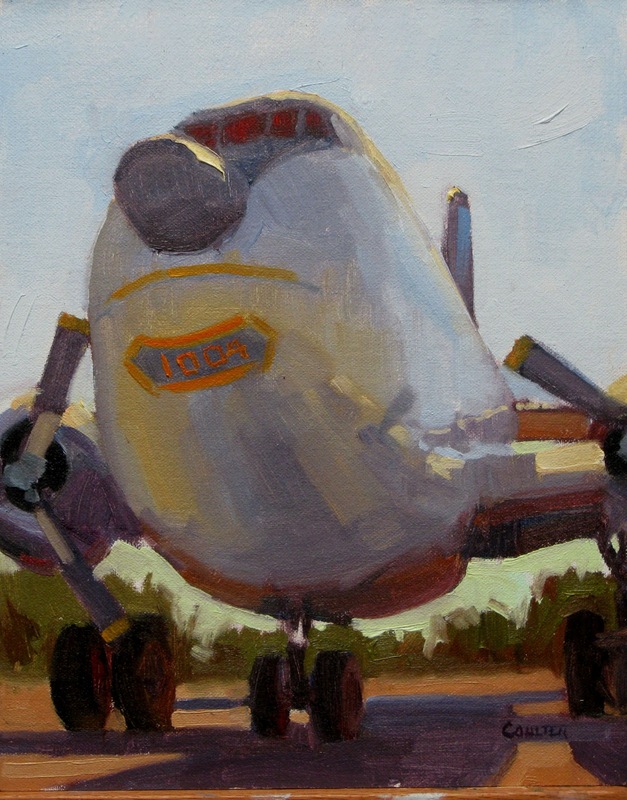 It was very exciting to be able to paint these incredible machines from the past. 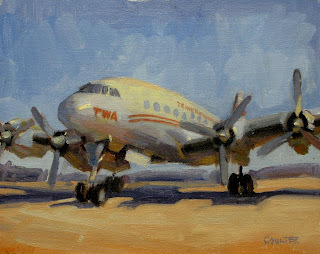 I picked out a TWA plane because I'm old enough to remember the day when this airline was the largest in the country. 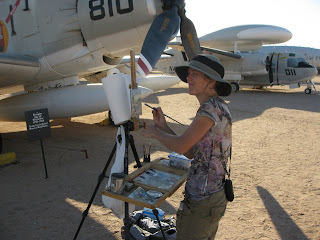 ﻿ Here is Carol painting what I had picked out as the ugliest plane I had ever seen. It was some kind of experimental plane with two props in the front. I loved it so much I talked her into trading it to me for one of my paintings. She is painting on the easel I invented (Art Box and Panel). Here is the other painting that I did that day. It struck me as being very small when I was standing in front of it. We ended up leaving that evening and heading north to a Ghost Town just above Jerome, AZ. More about that on the next post.